Posted February 7, 2019 by Plum Staff. Comments and trackbacks are open. Follow the comments feed. 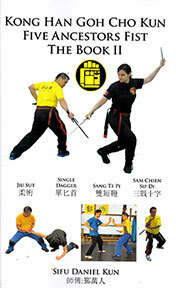 Tagged with: daniel kun, five ancestors fist, jiu sut, Kong Han Goh Cho Kun, nan pai, Ngo Cho, Ngo Cho Kun, Sai, sam chien sip di, sang te pi, short fist, single dagger, Southern Kung Fu, Wing Chun.